Saint Margaret of Scotland - Saint of the Day from "My Catholic Life!" In the early eleventh century, a Danish Viking named Canute reigned as King of England. Canute exiled his potential rivals from an Anglo-Saxon royal family. One of these exiles, Edward, made his way to Hungary, married, and had a daughter named Margaret who grew up in a well-educated, royal, Catholic home. Margaret’s father eventually returned to England at the request of the king, his uncle Saint Edward the Confessor, and he brought his family with him, including Margaret. But Edward died shortly after coming home, leaving Margaret fatherless, and then Edward the Confessor died without an heir. War broke out. In 1066 at the Battle of Hastings, the Anglo-Saxon English lost to the Norman French. 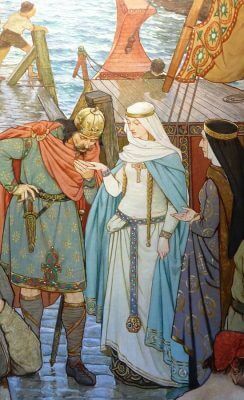 Margaret and her siblings were displaced to Scotland, far away from French efforts to eradicate Anglo-Saxon royals who had claims to the English throne. Thus was the circuitous route by which a woman of English blood who grew up in Hungary is commemorated today as Saint Margaret of Scotland. Saint Margaret was known to her contemporaries as an educated, refined, and pious woman. She married the Scottish King Malcolm who was far more rustic than herself. He could not even read. The earliest Life of Margaret, written by a monk who personally knew her, states that Malcolm depended on his wife’s sage advice and admired her prayerfulness. According to Margaret’s biographer, Malcolm saw “that Christ truly dwelt in her heart…What she rejected, he rejected…what she loved, he, for love of her, loved too.” Malcolm embellished Margaret’s devotional books with gold and silver. One of these books, a selection of gospel passages with illuminated miniatures of the four Evangelists, still exists and is preserved in an English museum. King Malcolm and Queen Margaret, along with their six sons and two daughters, truly created a domestic church dedicated to Christ and the Church. One son, David, became a national hero as King of Scotland and is popularly referred to as a saint. Margaret’s presence infused the unsophisticated, rural, Scottish court with culture. She brought her Roman attitude to the Church with her to Scotland, and so pulled the Scottish church into conformity with Roman and continental practice regarding the dating and observance of Lent and Easter. She encouraged the faithful to more fully observe Sunday by not working and she, like so many medieval royals, was a prolific foundress of monasteries, including one she intended to be the burial place for Scottish kings and queens. Margaret was known for her concern for the poor, spent hours in prayer and spiritual reading, and was skilled in embroidering vestments and church linens. Saint Margaret died, not yet fifty years old, just a few days after she was informed that her husband and son were killed in battle. Margaret and Malcolm were buried together under the high altar of a monastery. Devotion to the holy queen began soon after her death and she was canonized in 1250. Saint Margaret of Scotland, you were the model of a virtuous queen who cared for both the spiritual and material welfare of your people. Inspire all leaders to give personal witness to holiness so that, through their leadership role, they inspire their people to be more virtuous.